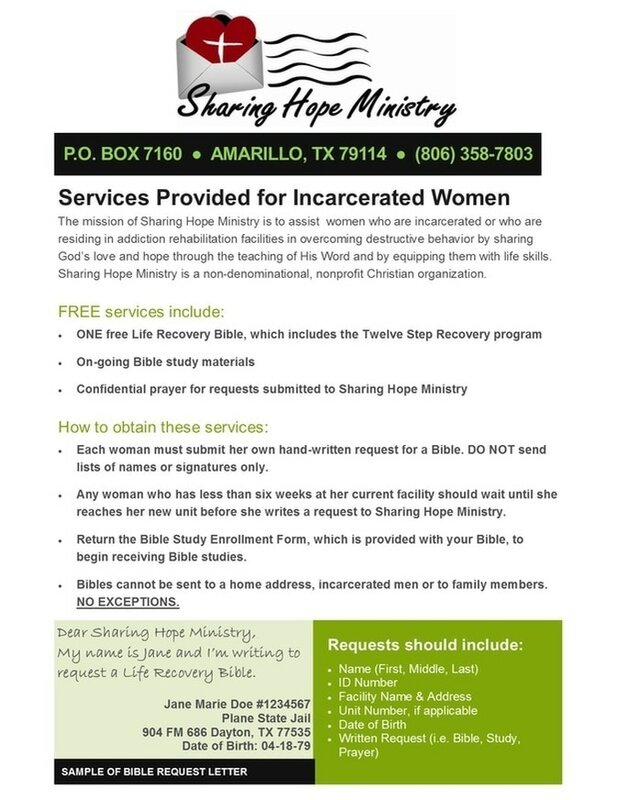 About Sharing Hope Ministry - Sharing Hope Ministry, inc. Patsy's Place Transitional Home, a safe and Christ-centered program where qualified women can spend up to 12 months, post-offense, learning to trust in God and reintegrate in the Amarillo community equipped with life skills. Providing services in 49 states! We believe the Bible to be the infallible Word of God, and that it is the supreme and final authority. We believe in One God, eternally existing in three Persons; Father, Son and Holy Spirit. We believe that Jesus Christ was conceived by the Holy Spirit, born of the Virgin Mary, truly God and truly man, and led a sinless life. We believe that man was created in the image of God, sinned and thereby incurred physical and spiritual death, which is separation from God. We believe that Jesus Christ became the sinner's substitute before God and died as a sacrifice for the sins of the whole world. We believe in His bodily resurrection and His ascension to the right hand of the Father. We believe that salvation, acceptance of Jesus Christ as our Lord and Savior, is a free gift of God and is received by grace. It is a gift that cannot be earned or achieved by works. Our faith is expressed in obedience, repentance and confession.